Relevant bachelor’s degree, or its equivalent in aerospace-related areas. High level of English proficiency. The program aims to teach students to find creative solutions taking into account the variety and uniqueness of problems dealing with space science and engineering. This program combines study of the general principles of complex engineering system construction with participation in satellite, drone and robotic systems-building projects. 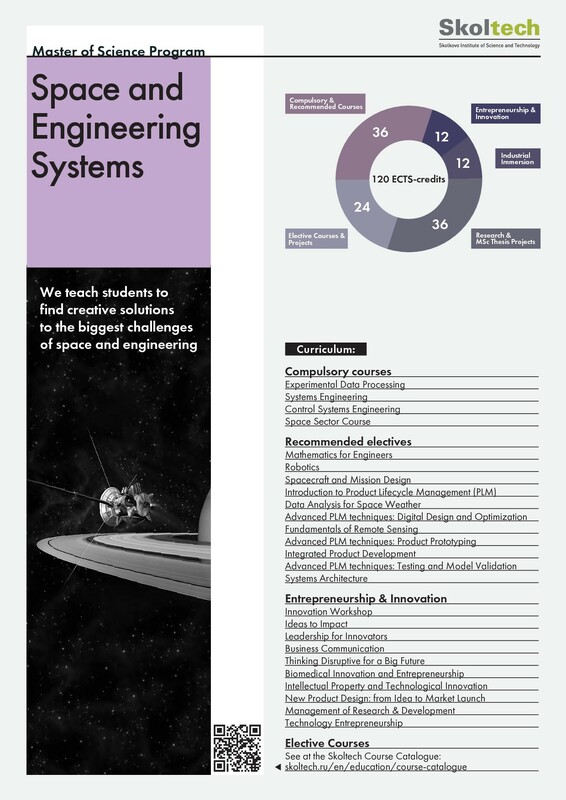 We teach students to find creative solutions to the biggest challenges of space and robotics industries. Conduct new observations and measurements from space. Students graduating with a Master of Science degree in Information Systems and Technology are in great demand throughout the international high-tech market. Startup. Starting a business on their own or through the Skolkovo innovation ecosystem with its extensive pool of experts, partners, consultants and investors. Ekaterina Kotenko-Lengold: second prize at SLUSH, position of vice president of Astro Digital company. Hripsime Matevosyan, PhD Student (Prof. Golkar): Emerging Space Leader Award (2015), International Astronautical Federation. Ignasi Lluch I Cruz, PhD Student (Prof. Golkar), «Innovative Earth Observation Missions» Paper Competition (2015), OHB System (DE). Dominik Knoll, PhD Student (Prof. Golkar), Selected as Top 10 paper of SECESA 2016 conference (60 submissions).